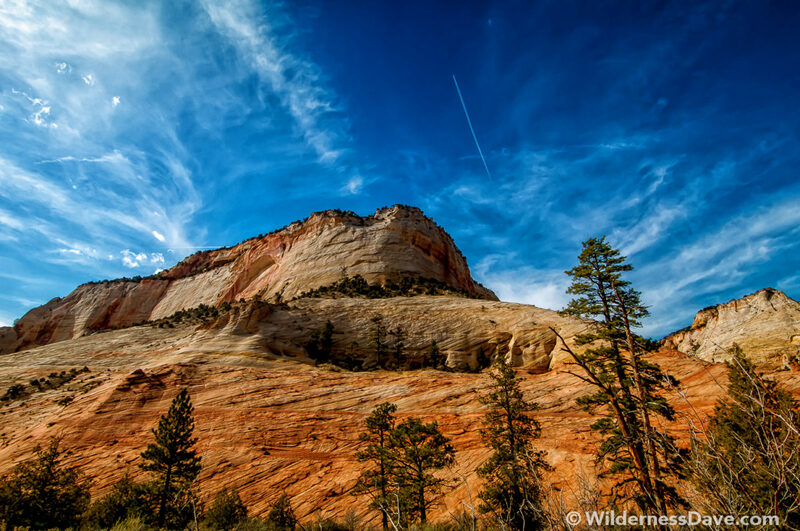 I’ve spent the last two days editing and fine tuning photographs from this weekend’s trip to Zion National Park. I’m very tired, but it’s been incredibly rewarding. I feel like I have some great images in spite of being overwhelmed by the enormity of such a small park. I tried not to approach my visit to this park with any specific photographic goals. Normally I research a location before I visit so that I can figure out which shots have been overdone, which iconic features are “must see”, or if sunrise or sunset are better times to shoot. With Zion I let all of that go and figured I would simply drive to the park and see what there was to see. I even resisted the urge to purchase a map of the park before my visit. I chose to drive in from the lonely east side of Zion. 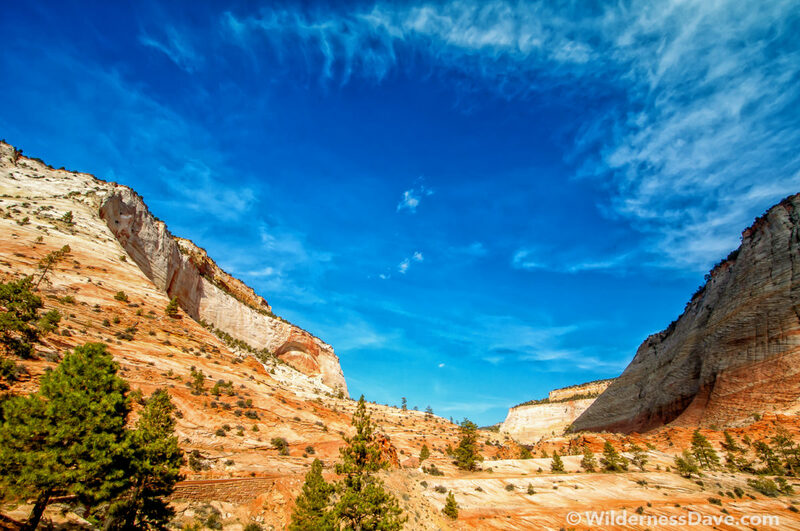 Coming from Phoenix, the route up through Northern Arizona and across Southern Utah seemed more adventurous and intriguing than zooming along major highways through Las Vegas. 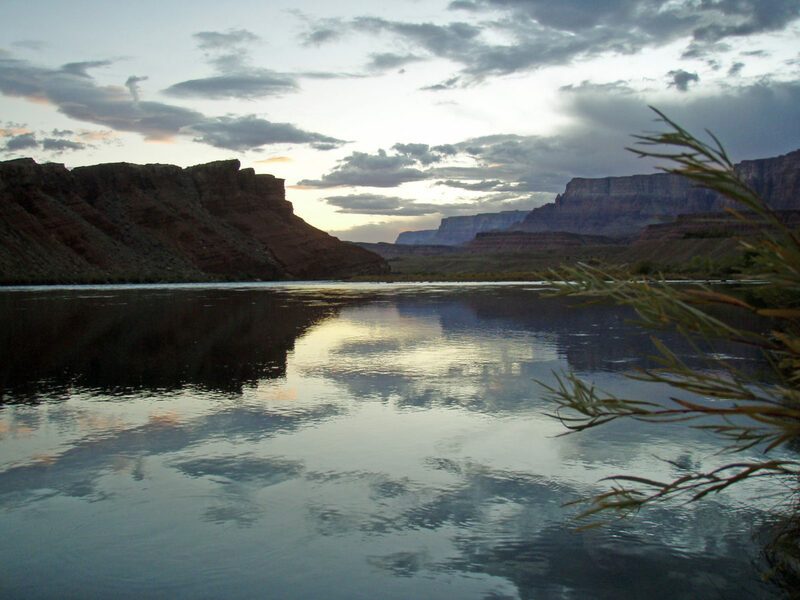 This route meant less traffic and rare views of the Colorado River, Marble Canyon and the Kaibab Plateau. It also meant there were no lines to get into the park. The east entrance was eerily quiet. As soon as I entered Zion, my truck slowed to a crawl. I’m sure there were the obligatory posted speed limits, but they were unnecessary as it is impossible to drive through Zion without slowing to look at the dramatic scenery. I don’t think I was inside the park boundary for more than five minutes before I was wheeling my grumbling truck to a dusty pullout and clawing at my camera equipment. My truck left idling restlessly with the rear door thrown open, I scrambled up a loose, sandy slope to capture my first shots of Zion National Park. I was not alone, other vehicles were strewn at random angles in haste as eager photographers abandoned their cars, trucks and rented RVs to point their lenses toward a dramatic, alien landscape. I pushed on, stopping here and there, but forcing myself toward camp. My adventure was just getting started and I had a partner-in-crime for the weekend that I had yet to meet. 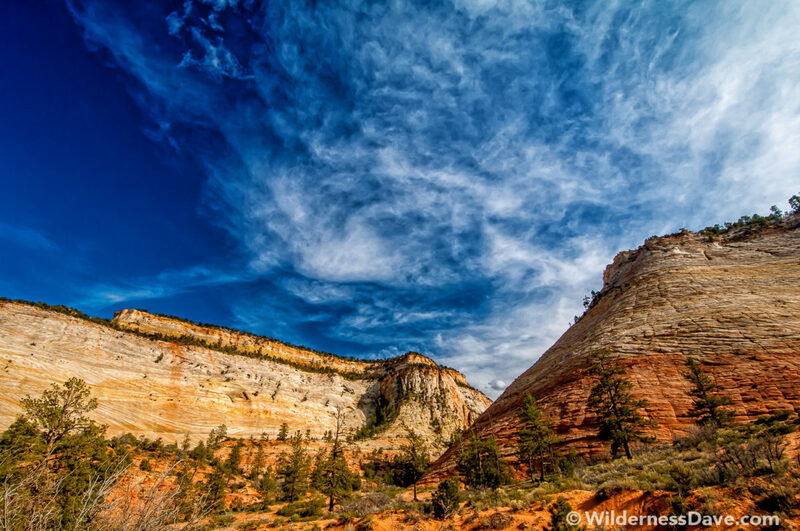 To see more of my images from Zion National Park visit my gallery. 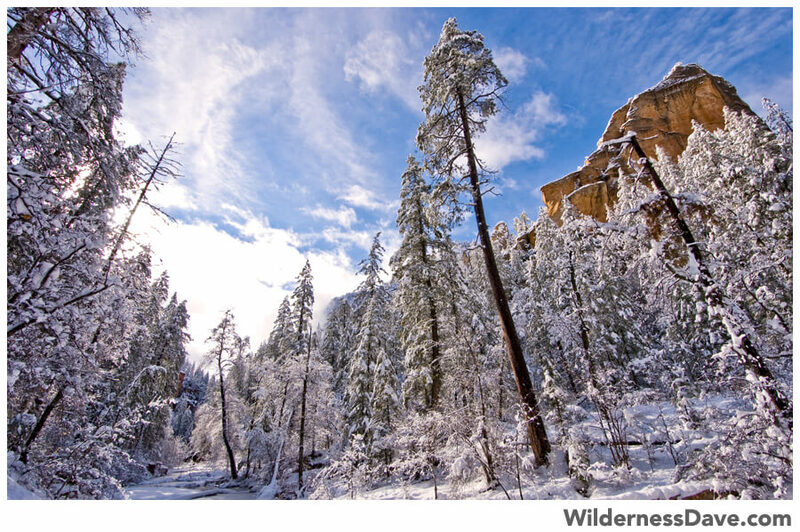 Back in December, I shot up to Sedona to catch the first snow of the season. It was a truly amazing day trip that resulted in some really beautiful shots. The day was just perfect for photography. The sunrise was bright and clean, the low wispy clouds clung to the base of the mountains and everything had a dusting of snow and frost. Sedona photography at it’s best and we took advantage of it. One of my favorite shots from the trip was not one of the spectacular sunrise directly, or one of the iconic rock features. It was a simple shot, just north of the Bell Rock feature. It was sort of a quiet moment for me in the frantic shooting that morning. We had been scampering around since the sun first crested the horizon, dashing about to catch different angles while we had the window of opportunity. Then I took a moment…just to take it all in. It was a beautiful moment and I smiled at the pure, simple pleasure of being there. As I took in my surroundings I turned away from the sunrise, something I hadn’t done yet, and there was this whole amazing scene behind me bathed in a warm glow. I took a couple of short steps to frame a few branches from a nearby tree into the shot. Shortly after that, I resumed my frantic shooting to grab what I could before the day pushed on. Shooting in low light (sunrise/sunset) can be difficult. The low angle light creates high contrast and vibrant colors but can be difficult to show without some “dark room” adjustments. Our eyes do a much better job of working with high contrast than the camera does, so to get a photograph that mimics the experience it can take a little work. For me, the biggest thing is to bring the shadows forward so that we can see what is hidden there. 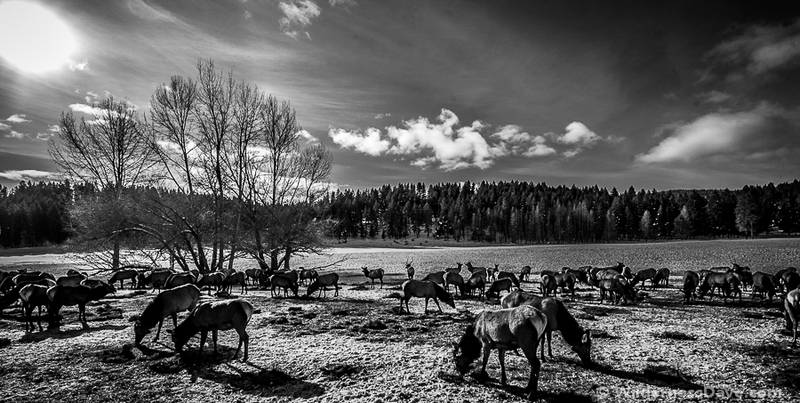 To do this (in Lightroom) I push light into the shadows, then immediately increase the Black to restore contrast. Increasing the clarity will also help bring detail out of the shadows and create contrast. I rarely have to adjust the contrast directly as the shadow and clarity adjustments do it for me. The problem with boosting light into the shadows is that you can lose detail in the highlighted areas. In this piece, the low clouds on the right became a white blob, but by playing with adjustments to the Highlights I was able to get the detail back. I don’t always boost the Saturation because it’s very easy to get a photograph that looks unnatural. However, adjusting the Vibrance setting (especially in sunrise/sunset shots) will bring out the vivid colors that make low light shooting so fun. At this point in the editing process Lightroom lets you fine tune the saturation and hue by color. I don’t play with this often as it will also easily create a look that is unnatural and “over processed”. But in some cases (like Red Rock country) where the colors can become either muted or oversaturated depending on the natural light, I will use these tools to push and pull to recreate what the scene felt like. You can see from the original shot that the details are all there. The light is much more subtle and the shadows disguise much of the section of trees in the middle. You also don’t get the feel of the sunrise which was much more vivid in person. The last thing I do once I have the colors and shadows adjusted is focus on detail. Lightroom has fine detail adjustments that let me strip out some of the noise and Sharpen the finer details. Sharpening the image will usually bring out even more noise, but by also increasing the Luminance to match the Sharpening I can drop the rough noise out. This, to me, results in a much cleaner and more readable image. Exp: 1/160, F/9, ISO-200, 10mm. I finally created a virtual gallery for my work! 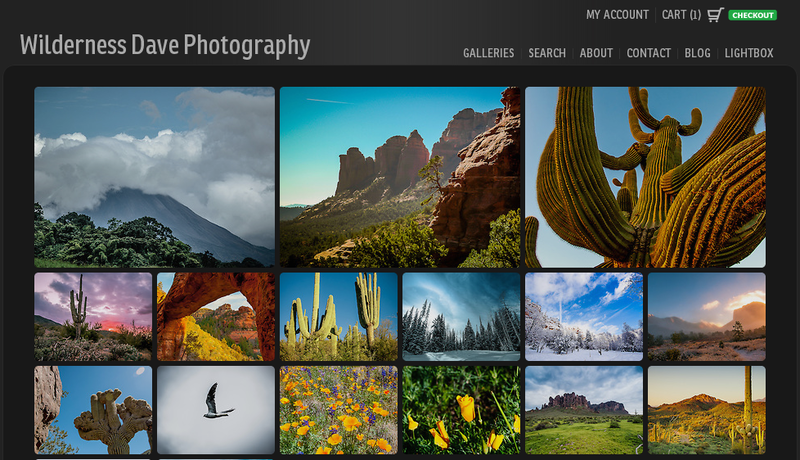 I’m really excited to introduce Wilderness Dave Photography where you can see (and purchase) the top photos from my outdoor travel sets. Go check it out, I’d love some comments and feedback. The gallery will be updated with new work as it is produced. Every week I will feature a special price on the Photograph of the Week for my readers if anyone would like to purchase a print. This week, use coupon code POTW4413 to get 40% off your purchase. This Photograph of the Week I almost didn’t catch. My wife and I had just moved everything she owns from Houston back to Arizona. We have waited nearly three years to be living together in the same house. We had solicited the help of her parents for the long drive across the southern states to Arizona. Having been home for most of our first week together, a good friend invited us up to his place in Cave Creek for a visit. We graciously accepted the opportunity. I had promised we would be in Cave Creek by 6:30 and I am not one to keep people waiting. 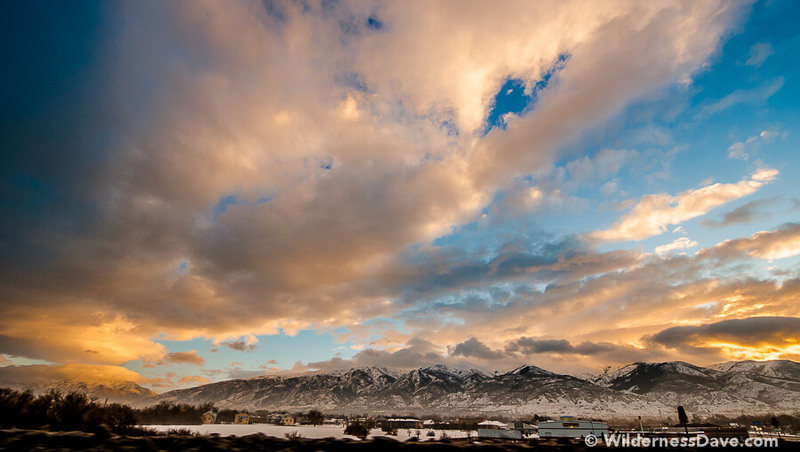 I had been watching the clouds all day and the sky was promising quite a show at sunset. A sunset that would probably hit it’s peak right about 6:15 or 6:20, just as we would be driving north to my friend’s house. 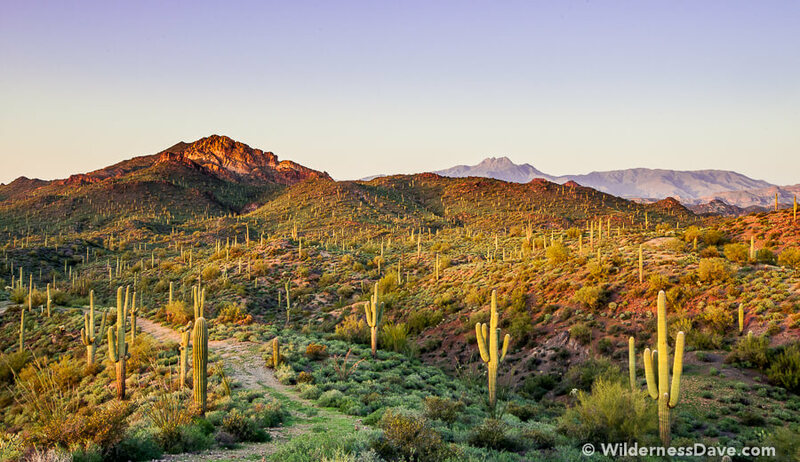 Before we left, I grabbed my camera hoping that we could make it to Cave Creek before the sunset completely disappeared. Sure enough, as we left the house the sun was settling low and the intense evening light was bending into an array of warm colors. The clouds that evening were hinting at a storm and made the perfect canvas for bold strokes of orange, red, pink and violet. I found it difficult to keep my eyes off of the sunset and I’m sure everyone in the truck thought I was nuts as I was mesmerized by the torrid display. I got us into the driveway just as the sun was disappearing, the oranges and deep reds and faded and the sky was washed with the afterglow of pink and violet tones splashed against dark stormy clouds. At the risk of being entirely inappropriate and rude, I said a quick hello then darted back to the truck and grabbed my camera. I rushed across the street from my friend’s house, which was luckily next door to natural desert, and snapped off a few choice shots. It was hard to tell if I had caught enough of the light. The pink tones were so subtle as the sun faded they could easily not show up. Luckily, with some developing in Lightroom I was able to enhance the subtle tones in the finished image. I almost missed this one, and certainly missed the grand show. But what I did capture was something that I think turned out much more compelling than the blaze of full sunset at it’s peak. The mood in this photograph plays a much deeper, more intricate melody. 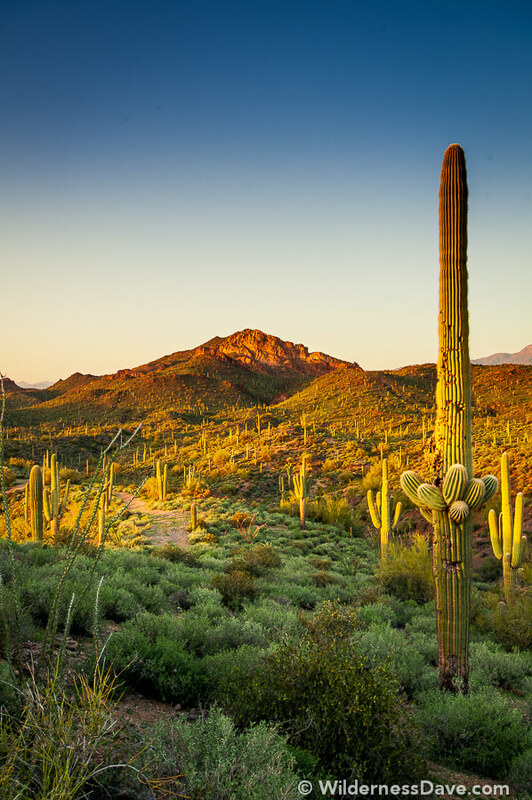 We truly have some of the most amazing sunsets in the world here in Arizona. As a budding photographer, it’s heartbreaking to miss opportunities to capture something amazing. But if you pay attention throughout the day, and you are prepared with your equipment at the ready, you’ll have the advantage. Exp: 1/20 sec, F/4.5, ISO-200, 24mm. 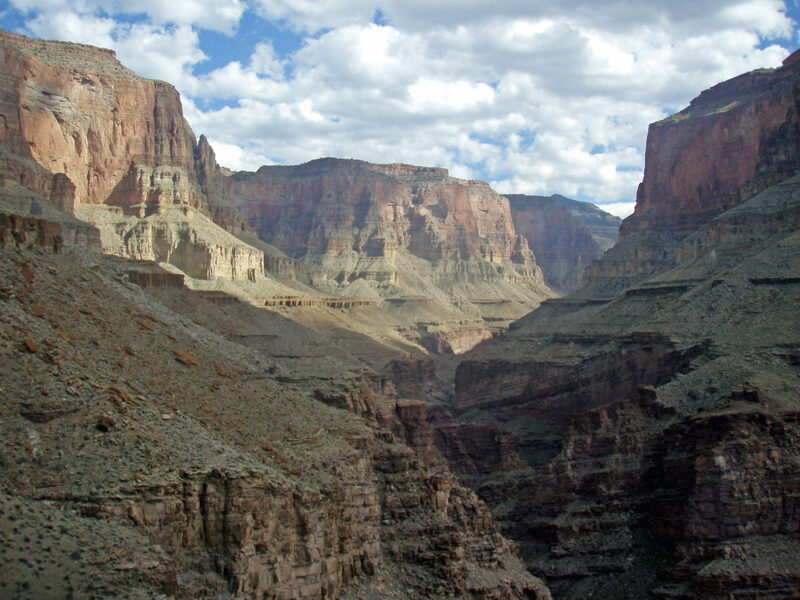 Back in 2007 I spent a month rafting the Colorado River through Grand Canyon on a private boat trip from Lee’s Ferry to Lake Mead. I was very nervous about bringing my DSLR on a month long rafting trip so I took my Olympus Stylus I purchased just for that trip. While a great little bomb-proof adventure camera, the images were not great. At the time, I had little experience editing/enhancing photos in PhotoShop (or any other software for that matter). So they collection of images sat around. As I’ve been going back over older images shot with the DSLR I got to thinking about what I might be able to coax out of some of those old Point-and-Click images. There were some nice shots in there that just came out flat and uninspiring, shots that just needed a little help. Most were either blown out or too grainy to really do much with. I did find a handful of images with enough potential to work on and was pleasantly surprised with how much I could do with them in Lightroom. I believe this was our first night camping at Lee’s Ferry before we put-in for our trip. 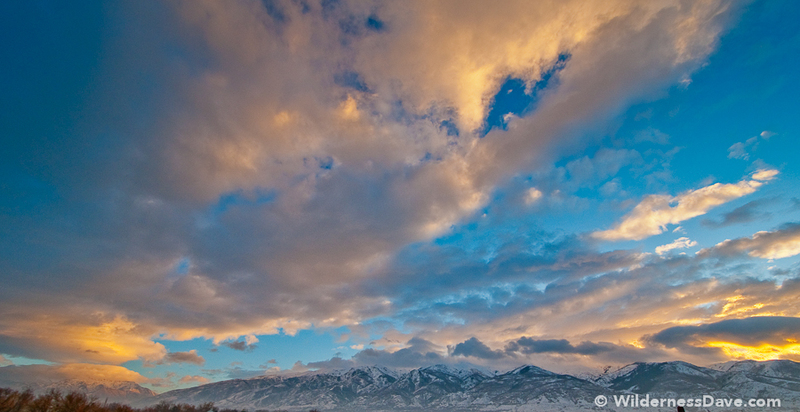 It was on it’s way to being a chilly night and the sunset was crisp, clear and vibrant. I got the camera out and snapped a shot thinking I had really managed to capture this brilliant sunset with it’s reflection in the water. The actual image wasn’t as dramatic and I was disappointed. Even looking at it again, I wasn’t sure if there was enough there to really get a nice image out of it. But there is good contrast, potential for color and it’s a relatively clear image compared to the graininess in some of the others. So I brought it into Lightroom and started playing with it. I pushed in some fill-light to reduce the shadows and increased the clarity to get some detail out of the cliffs. This already started bringing the colors out a little so when I got in to adjusting the saturation and luminosity the sunset came alive. Without having to push artificial color in to the sky, the yellows and oranges burst out and the reflection in the water became more dramatic. I pushed a little on the violet and purple spectrum and brought some color out of the cliffs. I finished my editing with a minor crop to balance the composition and the final image now feels like the sunset I tried to capture on my trip. You can tell I pushed a little too hard in some places and the image comes out little grainy in places, but the colors and depth are much improved. 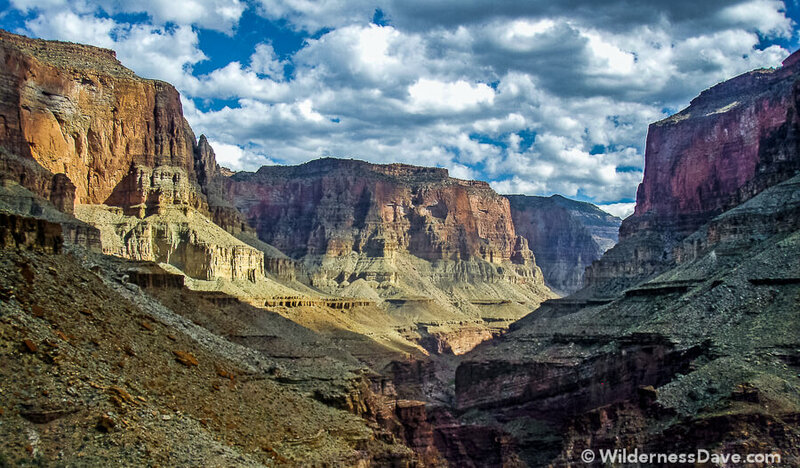 This shot was taken from one of the side-hikes we took into the Canyon off the river. I liked this shot because it really represented the view we had from inside the Canyon – high, colorfull cliffs and endless canyon walls. This shot had a good detailed foundation to work with and the colors in the rock are very washed out. I thought it could handle the increase in contrast and clarity needed and I wanted to see if I could enhance the colors enough to bring out the cliffs. As usual, I started with tonal adjustments and tried to create depth in the shadows. Then it was a matter of fine tuning the colors, careful not to over-saturate the cliffs past the point of reality. I managed to get some great color out of the rock, the detail in the cliff faces came out nicely and as a bonus, the sky brightened up and brought more attention to the clouds. I wasn’t very happy with the lower details in the cliffs where they start to crumble and slope out, so I cropped some of that out to bring focus to the colorful vertical cliffs and the sky. When you revisit old images, do you ever think to try new software or new techniques to bring them back to life? I might start looking at doing this more often. Only a couple of days after my Sedona trip with Tim I left for Houston to spend some time traveling East Texas with my new wife. I flew out and the next morning we headed north in her little Honda Civic for Nacogdoches, a small town a couple of hours north of Houston. The claim to fame of this little Texas tourist destination is that it is the oldest town in Texas. Originally a settlement of Caddo Indians, the official town of Nacogdoches was founded in 1779 by Gil Y’Barbo with permission from the Spanish Government. My wife and I spent a day hiking trails and exploring the small downtown shops and restaurants after spending the night in a really nice, rustic B&B cottage outside of town. The history in Nacogdoches is rich and there are still some original buildings from the early 1800’s. 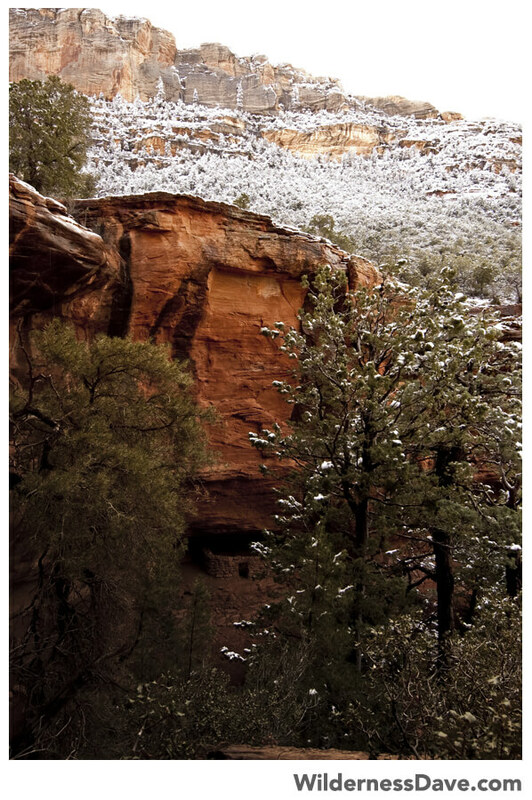 Outside of town are the Caddo Mounds, archaeological sites from around 800 A.D.
Jabon and I had been talking about heading to Sedona to catch images of fresh snow for months. Jabon had been discussing this prospect with another friend for close to two years. So when snow came to Sedona, we both were ready to drop everything and go. 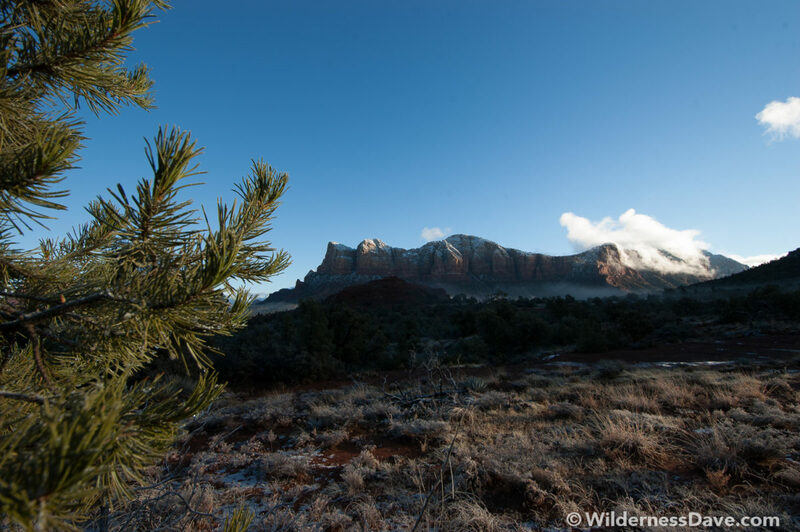 It was starting to snow in the upper elevations around Sedona by Friday night, I didn’t get back in to Phoenix until Saturday evening and had plans for Saturday night. 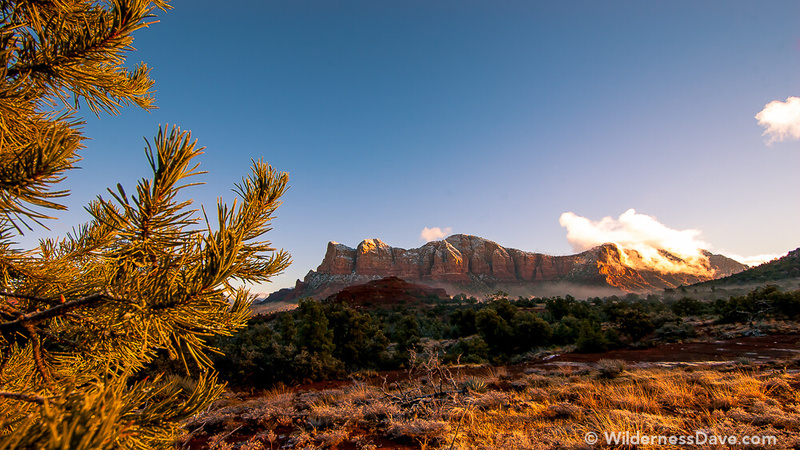 Jabon and I laid plans to drive up Sunday morning, early, and be in Sedona before sunrise…and this time I meant it! Once again, I found myself forced to leave a party early so I could get a few hours’ sleep before driving north for an adventure. Jabon arrived at my place right at 5AM, I was already packed and had the truck running to warm it up. Jabon’s buddy Mike was due to join us, but no one had heard from him and Jabon’s attempts to reach him went unanswered. We soon left, figuring if he was running late he’d call and we could turn around and toss him in the truck. We never did hear from him. There was little traffic on the cold, dark drive to Sedona. Aside from hitting a patch of black-ice at about 80 MPH (and totally maintaining control of the truck without spilling a drop of the coffee in my hand) and missing my exit onto 179, the drive was uneventful. 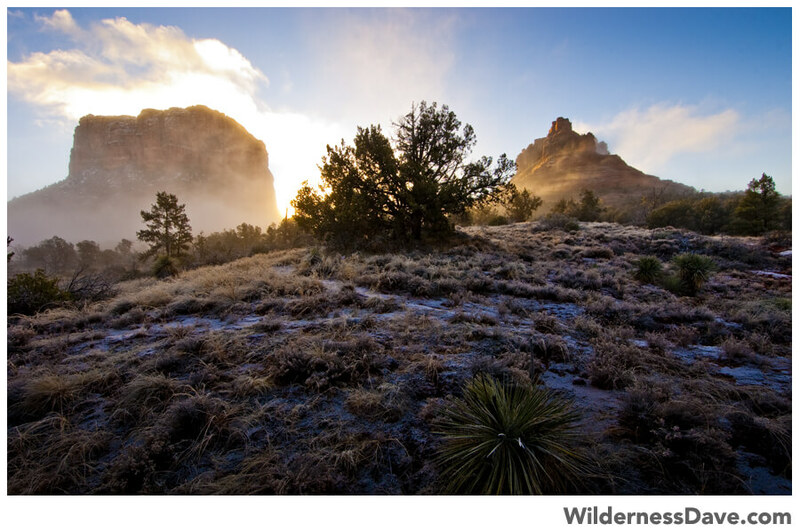 Even with lost time we hit Bell Rock just as the first light of the morning sun was beginning to endow the frosty morning mists with a supernatural glow. We stopped the truck and quickly got out to chase the first photo-ops of the morning. 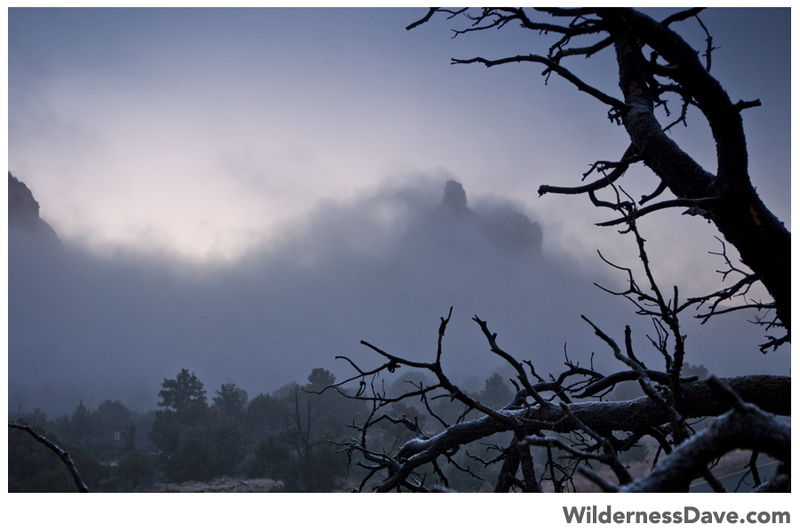 I ran across the road and scrambled to higher ground across frost covered red rock ledges looking to capture the mood of the view that was unfolding. 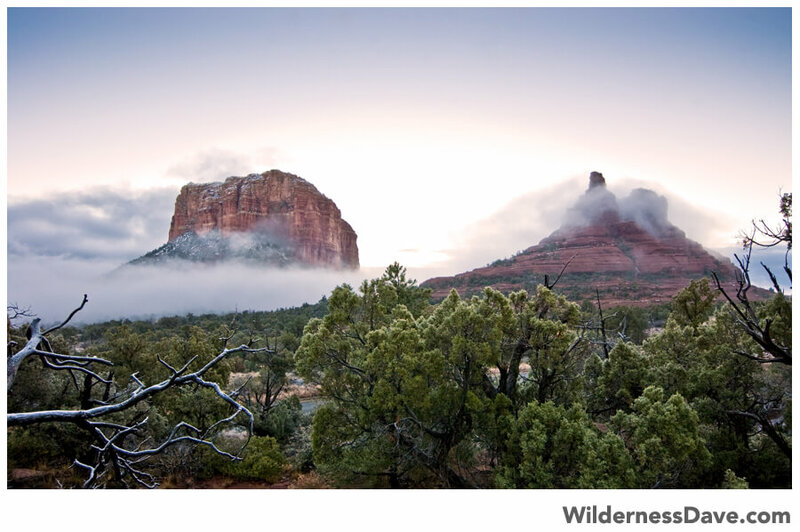 The thick, wispy clouds clung to the desert floor and gathered around the base of the red rock towers to the east. As the sun climbed higher it gave life to the misty fog, like stormy seas crashing around these crimson battleships in the desert. 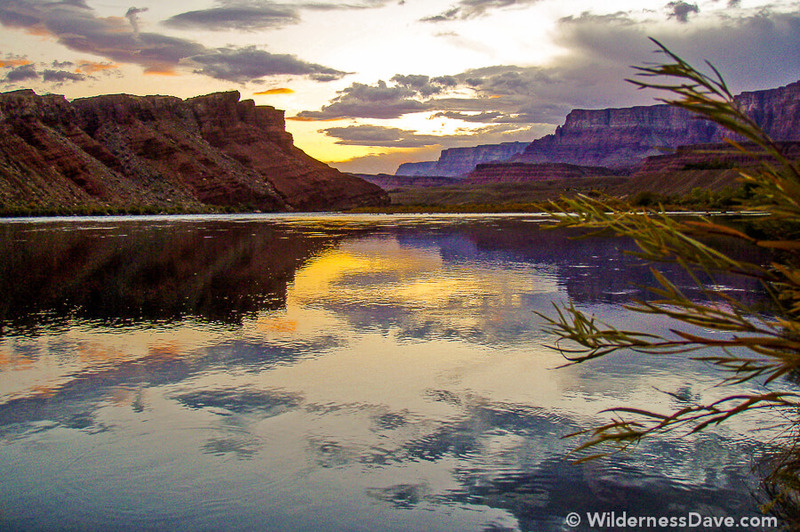 When we came off the trail, after exhausting every photographic consideration, the parking lot had filled with early morning photographers looking to snap their own versions of this amazing sunrise. I was glad our ambition had carried us there first, before it got crowded. There was thick frost on the ground, but we still weren’t high enough to be in the snow…and that’s why we were there. 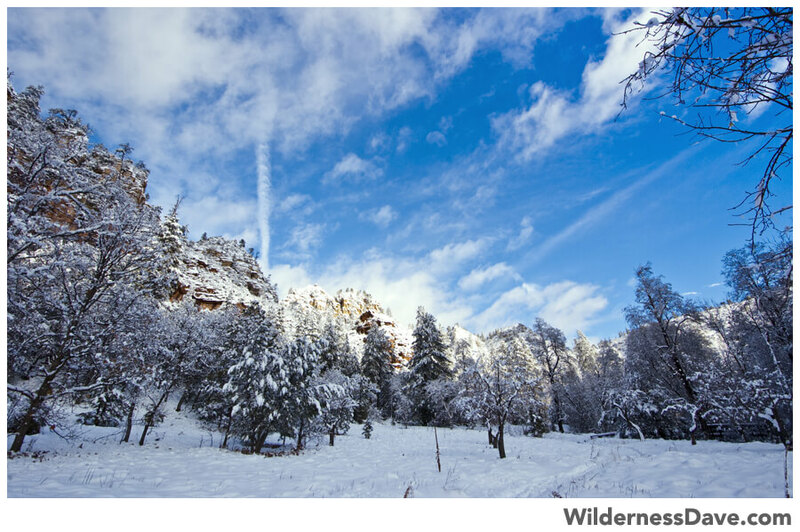 So we loaded up and continued through Sedona and on in to Oak Creek Canyon where the snow had collected over the weekend. I had to stop the truck several times before we made it to West Fork because the view along the road was too good to pass up. 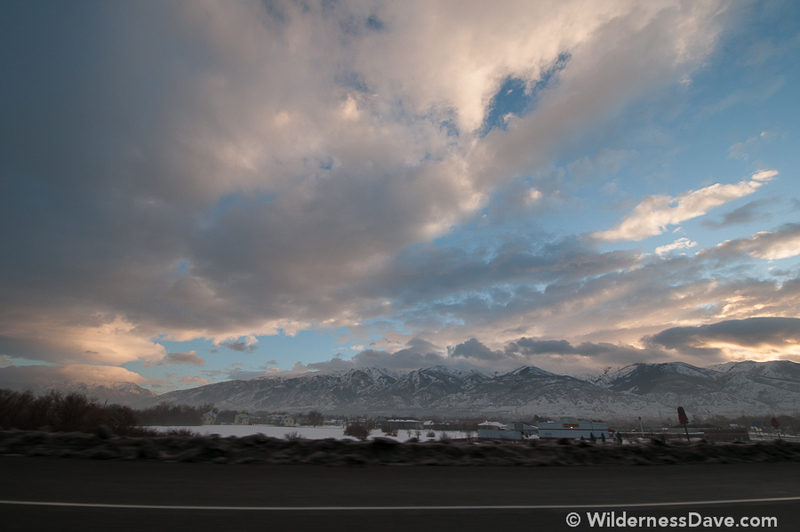 We would stop, pile out of the truck and scurry along the narrow shoulder snapping shots as the light and shadow played with the mountain tops. Then quickly back to the truck to move on so we wouldn’t miss the best light further up. We finally made it to the West Fork parking lot, which was closed, and found a spot further up along the road where we could legally park. We hiked back toward the trailhead along the roadside careful of the growing traffic on the narrow, winding roads. 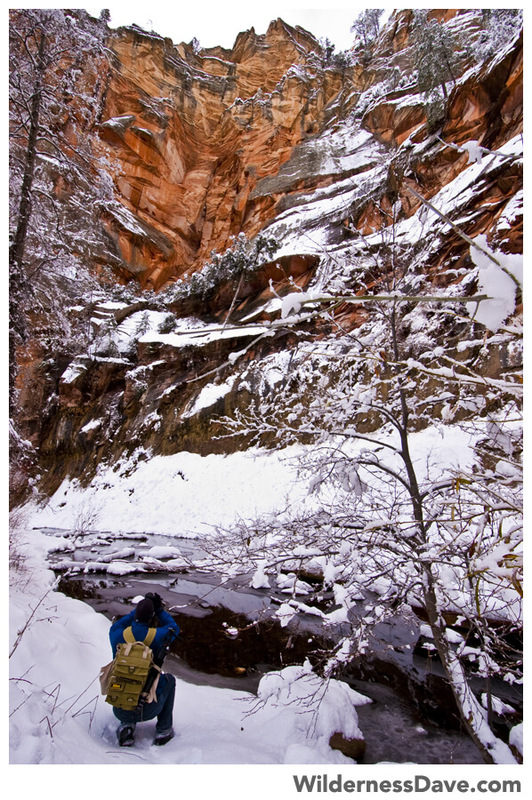 We were not the first ones to the West Fork trailhead and we followed the footprints through the snow back in to the canyon collecting shots along the way. 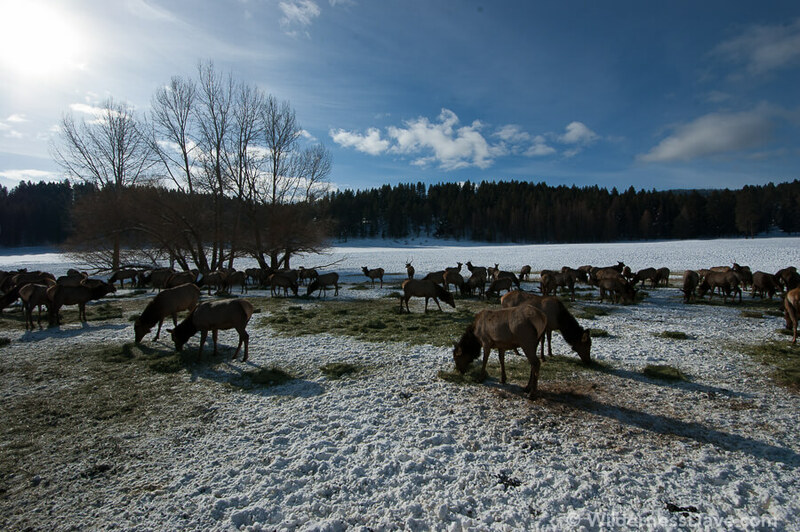 Once we reached the first creek crossing, the foot traffic grew thinner…not many wanted to cross the frozen water. We took our time and watched for subtle changes in the light inside the canyon trying desperately to choose our shots wisely. 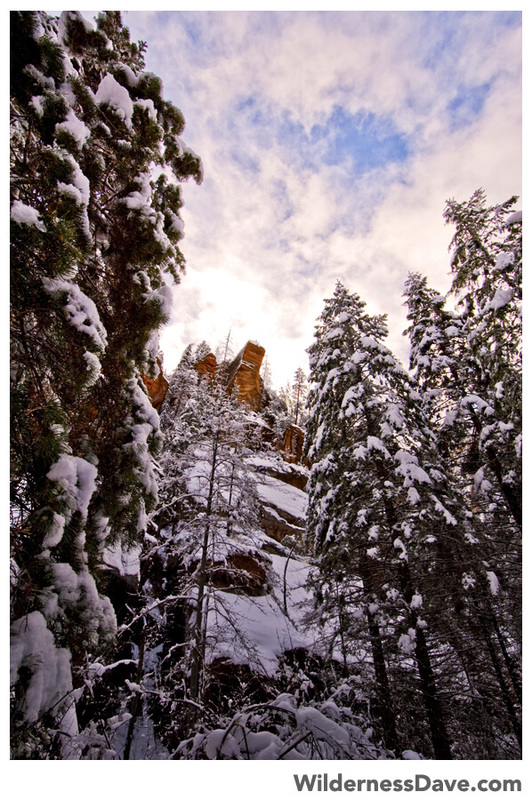 The snow was 6 to 8 inches thick and clung fresh and soft to the rocks and trees. This was one of those perfect places where you could easily snap off thousands of photographs if you weren’t more discerning. The combination of the brilliant red rock in the intense morning light against the stark, clean whiteness of the snow was a dramatic scene. Then layer in the deep emerald of the tall evergreens, the electric blue of the sky all of it wrapped in the ever-changing misty morning clouds. Living in southern Arizona and growing up in California, I haven’t had opportunity for much hiking in the snow. I really enjoyed this hike! Snow along a trail, even an easy one like West Fork Trail, completely changes the hiking experience. Finding the route is challenging unless there are footprints to follow, the deeper snow forces you to pay closer attention to each step. Snow covered trails also means fewer people in most cases, which is how I like it. My wife loved snowshoeing in Tahoe for the same reasons. 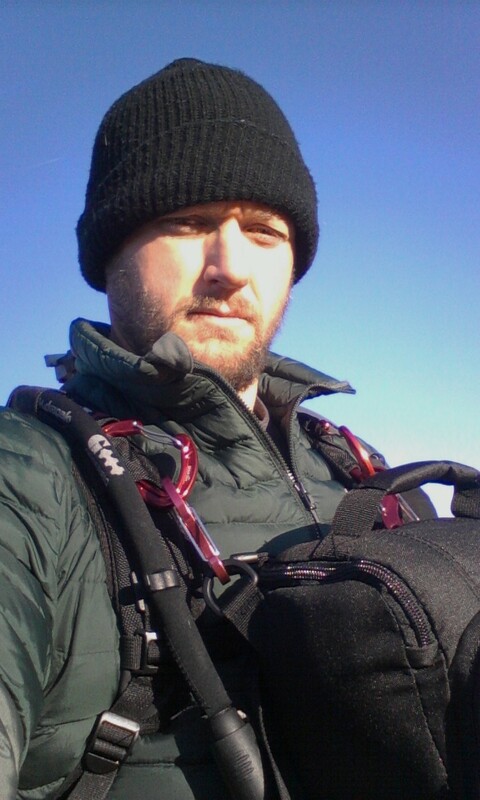 I’ve collected better Winter gear and will be looking forward to more snow hiking. Soon there was only one other set of footprints in the snow, only one person ahead of us. We finally came across her as she was headed back, another photographer out to capture this pristine wilderness. Soon after that we stopped near a large boulder along the creek and where I heated up water for hot cider. We sat there for a while, watching the light change in the canyon and snapping off the occasional picture. Jabon took some shots of the frozen creek and we both worked to find angles for shooting the icicles hanging from the huge boulder next to us. Heading back out of the canyon, being scolded for hiking in a “closed” area. Some of the other early morning opportunists had received violations for parking in front of the closed gate. We drove higher up the mountain after helping an older couple get their car out of the snow bank long the road. There was little more to see and the casual visitors were starting to get thick as the morning grew late. Jabon suggested we head in to more remote country and offered to show me a set of ruins he’d photographed a while back. He was anxious to get another opportunity to shoot them, especially with snow around. We had time so we headed down a muddy 4-wheel-drive road to a remote canyon where Jabon led the way into a small obscure canyon. After climbing up the drainage, we reached the head of the canyon. A rounded bowl lined with 100 ft sheer red rock cliffs opened before us. Tucked unobtrusively under a recessed ledge at the base of one side of the vertical canyon walls is a small, semi-circular stone structure. The lower portion of the walls are original, still held together with ancient mortar. The top has been obviously reconstructed including the lintel above the entrance. The interior shows recent use, and even relatively recent remnants of a camp fire. The site was simple, but the setting was magical. I was really glad we could squeeze this last little excursion in to the day. It was getting late after that and we’d had an incredible morning. Both of us were anxious to get back and start going through our images. I am really happy with what we captured in Sedona that day. It was one of those trips that we’d talked about taking for a long time and it turned out to be even better than we could have imagined. 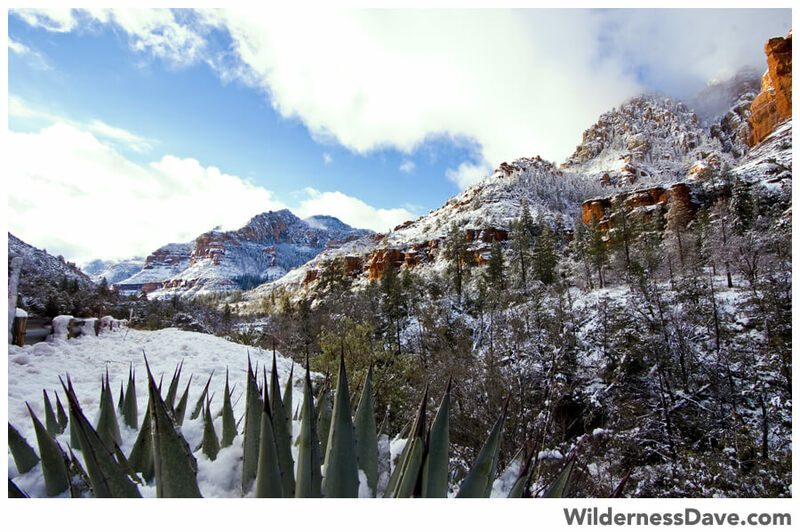 Luckily the first snow of the season was a good one and it laid down thick and clean all over the upper elevations around Sedona. I don’t know how I’m going to be able to top this trip…but that won’t stop me from trying! Jabon is another one of those great friends I’ve met through Social Media. I found him a couple of years ago when I did a quick search and discovered that he and I were planning to take groups on the same hike on the same weekend. 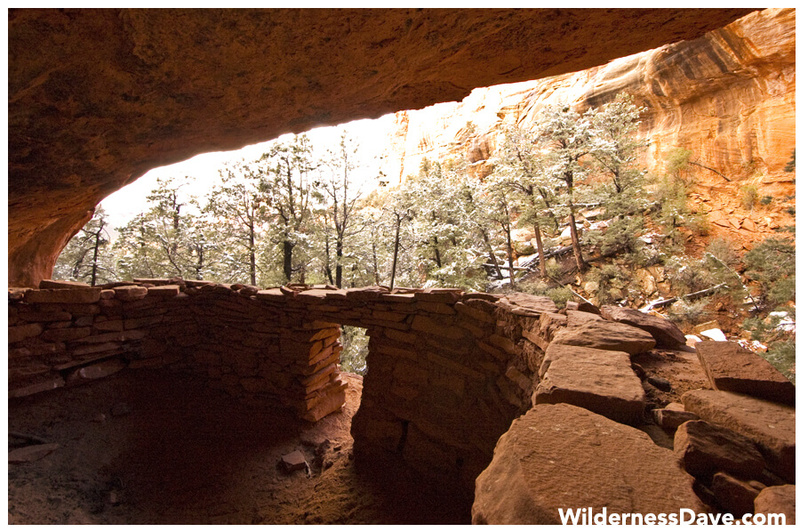 I reached out to him about the possibility of combining our groups and we hiked to the Pueblo Canyon Ruins together a few months later. Since then we’ve talked about many possible adventures and collaborations. We also have done Cold Spring Canyon, a quick photo-hike to Tom’s Thumb and this Sedona trip. You can check out more of Jabon’s photography on his website or visit his Facebook Page.